Foodspiration: All American Box of Donuts! About 9 kilometers into the 70,000 person strong foot race, a photographer snaps our picture and then starts taking down our info for a potential caption: names, spellings, relationships, where we're from, and what our group wants to be called. The answer to that last question may have been the one thing that we didn't put much thought into, but Vince shot back with "an All American Box of Donuts". Photo Credits to D. Cameron of the Oakland Tribune; as far as we can tell only published on Flickr . . . copy forwarded to us by the photographer. The annual Bay to Breakers race is a San Francisco institution on the third Sunday of every May. Initiated after the 1906 earthquake with a purpose to raise the spirits of the battered citizens it has morphed over the last 97 years into a enormous mobile street party. 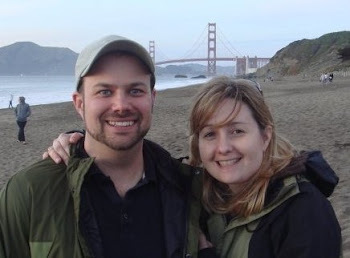 One that has a distinctive Bay Area flavor and set of traditions . . . costumes, political statements, and alcohol transporting devices disguised as various props. We had participated the previous year with our friends Vince and Kristi in a group costume, but wanted to set the bar a little higher this time. So we combined our love of simple baked goods with some fly-by-the-seat-of-our-pants engineering to create something that was both group costume and mobile float. 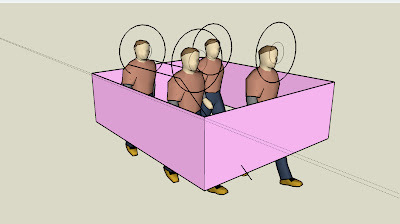 Vince and I started exchanging ideas and we finally settled on a donut concept that would involve each of the four of us wearing a donut around our heads and carrying the iconic pink bakery box about our middles . . . not just donuts, but a box of donuts. First visualization of the Box of Donuts concept using Google SketchUp. Some of our preliminary experimentation led us to a design where the donuts would hang around our necks rather than encircle our faces. We wanted a large size donut for maximum impact visual impact and decided that something that rested on our shoulders would be more comfortably carried for the 4+ hour walk/run. Since even the cheapest fabric isn't that inexpensive ($1.99/yd) we started out using newspapers to form and stuff our prototype. Our first prototype (front and back) using newspapers and tape. The measuring and cut procedures were improvised using a homemade compass tracer . . .
Measure once, cut twice. Above: a homemade compass used to trace out the circular arcs in the fabric. Below: Justin and Vince pose with stuffed donut pillows awaiting frosting and sprinkles. Thanks to Lauren's mom, Gail, for technical assistance with the sewing machine. 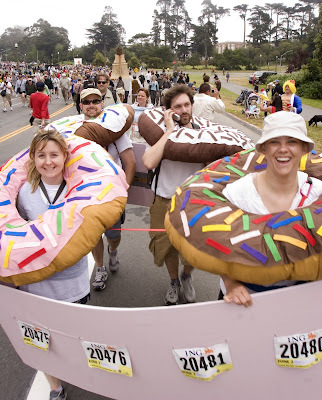 The design specifications for the donut box included the need to be easily transportable on the BART train on the morning of the race, the strength to resist blunt force impacts and extreme crowding due to people density in the initial race queue, and the give necessary to allow us to nimbly weave around stumbling drunks. To address these criteria we built the box in four identical sections that could be stacked and carried then assembled at the starting point. The thick cardboard and steel tape reinforcement provided surprising panel strength as the sections bowed yet did not fold or collapse over the race course. Steel tape also joined the sections at the corners and allowed the box to parallelogram when necessary. This allowed us to move in a freer fashion than absolute lock step. This flexibility helped maintain overall integrity by allowing a moderate distortion to occur and easily recover rather than break at the corners when impacted. The harness was added at the last minute so we fashioned it in such a way that the specifics could be easily improvised on race day. Donut Box consisted of cut refrigerator box sections reinforced with steel tape and covered with pink fabric. The harness system was affixed at corners and consisted of tubular webbing and carabiners. Film from the Donut Cam. Edited down to 2 minutes from 1 hour to a PG-13 rating. Looks like a fun time and a very creative costume concept! !